If your order weighs less than 13 ounces, save huge on shipping with USPS first class (with tracking number). This product weighs 8.1 oz. Calcium Plus Vitamin D by Nature’s Sunshine is a formula that provides nutritional support to the bones, ligaments, skin, and tendons. 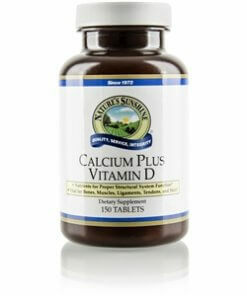 Calcium Plus Vitamin D provides a group of ingredients that work in synergy for maximum effectiveness. For example, calcium is important for muscle contractions. Phosphorus works with B vitamins to maintain the right balance of fluid in the body, while vitamin D helps calcium work properly. Adults need a minimum of 400 mg of vitamin D and many people don’t get that amount in their diets or through sun exposure Calcium is also a necessary part of bone health and adults need approximately 1,000 mg, which would be the equivalent of about 4 cups of 1% milk. 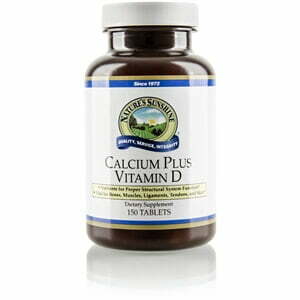 Nature’s Sunshine Calcium Plus Vitamin D is just what you need to provide the proper nutrients to bones, tendons, and skin. Sorbitol, Cellulose (plant fiber), magnesium stearate (vegetable), and Alfalfa herb (Medicago sativa).